The I Am UU project has always been a lay ministry; a grassroots effort not tied directly to any one congregation, not overseen by the UUA, not even curated by an ordained minister. That much is very unlikely to change. Something exciting has changed, though. The UUA is moving to recognize ministry as something more than leading a congregation in worship and/or providing pastoral care and chaplaincy, as important as those things are. As it says on UUA.org, “Everyone has gifts to share with their faith community and the wider world. Unitarian Universalists understand ministry as the way we share our spiritual gifts and encourage others to share their own, connecting with what is most meaningful in life.” Consequently, the UUA wants to recognize ministry as something that reaches beyond congregations, as the Universalists did a century ago. Friends, I am very excited to say that I, the founder and administrator of the I Am UU project, have been accepted into the UU Society for Community Ministries. As a result, the I Am UU project gains a level of recognition that I did not believe was possible 2 years ago. This community has impacted the world and we have touched lives, together. Make no mistake, you all are vital to this work, because my efforts would be feeble without you all offering your feedback, engaging with the work, and sharing the things that speak to you; this is a shared ministry between you all and myself. Together, we have built something that matters. We have built something that has made the world a little better. It is something that has changed a few lives and brightened many more. I have been charged, on behalf of our community, with a deeper obligation to meet the world. I am excited to invite you all to join in making that a little easier. All of you reading this now are part of making this possible. Any of you who click out links, make comments, offer feedback, and share our posts make this ministry possible. If you would like to take the next step and have an extra dollar or two a month, I remind you that we are also crowdfunded; like a lay-led congregation (or NPR), we rely on those of you who value our work to put a number to that. If you don’t think we’ve earned a few dollars, we welcome constructive criticism on what would change that. Of course if your budget is too tight for that few dollars (as it is for too many of us), know that your continued engagement is still valuable and much appreciated. So, while very little will be changing for the vast majority of you, please know that this is a huge development for me and the project, and that it signals a really important shift in Unitarian Universalism. 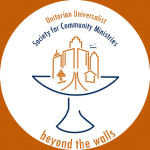 Expanding ministry beyond congregations means reaching people who have never heard of Unitarian Universalism. It means serving people who need us, even though they will never sign the book. It means doing good where good is needed, and living up to the promise of our Principles. Our small part of that is bringing Unitarian Universalist values, ideas, and inspiration throughout the week and trying to make liberal religion easier to understand and share. We invite you to tell us how we are doing. Congratulations, Thomas!!! You are visionary, bold, kind and wise! Thank you for your energetic outreach!